(2) the efficiency of the stream ecosystem in metabolizing those energy supplies versus export to downstream ecosystems and possibly to the oceans. Principal approaches include the comparison of GPP to ecosystem respiration, mass balance estimation of all inputs and exports, and measures of the efficiency with which organic C is utilized. Organic C budgets are based on the estimation of all inputs, standing stocks, and losses within a stream reach or, ideally, a catchment, although the latter is practical only for headwater streams. Budget studies demonstrate the overwhelming importance of climate and the terrestrial biome on the relative magnitude of allochthonous versus autochthonous inputs. Inputs of coarse, fine, and DOM from terrestrial primary production typically dominate the energy supply in small, forested streams where algal primary production tends to be light-limited, but primary production is of greater importance in open locations that receive sufficient light. Thus, longitudinal position and landscape setting determine the relative magnitude of sources of organic C to stream ecosystems. Aridland, meadow, and prairie streams have high primary production relative to detrital inputs, forested streams are the converse and highly dependent upon external energy inputs, and lowland streams have large quantities of DOC and POC in transport. The relationship between GPP and ecosystem respiration, expressed as the P/R ratio or NEP, indicates whether an ecosystem is reliant on internal production or requires organic matter subsidies to sustain respiration. Wherever GPP is low relative to ecosystem respiration, a stream clearly is dependent upon external energy inputs, either from the adjacent terrestrial ecosystem or from upstream sources. 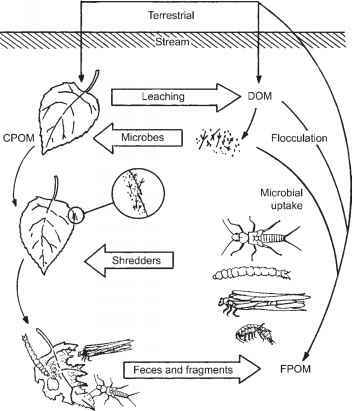 Stream ecosystems where P exceeds R are likely to export organic matter to downstream locations. Although a P/R < 1 has often been used to indicate a stream ecosystem dependent upon microbial production fueled by the breakdown of allochthonous material, the transition value at which stream metabolism depends equally on autochthonous and allochthonous production likely falls between 0.5 and 1. The numeric value of the metabolic transition is difficult to ascertain because ecosystem respiration includes the activities of heterotrophs as well as autotrophs. Nonetheless, P/R and NEP both show the influence of longitudinal and landscape position, increasing downstream from forested headwaters and exhibiting low values in forested locations and high values in aridland and other open locations. Stream ecosystems are relatively inefficient at mineralizing their inputs of organic C, as indicated by comparisons of processing rates to transport rates, of outputs to inputs, and of C turnover lengths. Globally, rivers export significant quantities of organic C from terrestrial primary production to downstream locations and the oceans. Streams of low order unquestionably are inefficient, exporting large quantities of FPOM and DOM. Large rivers also have substantial POM and DOM in transport, but declines in DOC concentrations in lower reaches of large rivers and their supersaturation with CO2 provide evidence of substantial metabolic activity, indicating that significant mineralization takes place near the lower terminus of rivers.